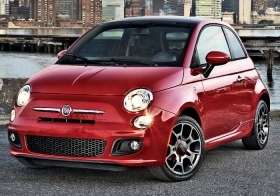 The Fiat 500: Fewer than 16,000 U.S. sales through October. Chrysler Group is sharply outperforming the market this year, has charted a healthy course to profitability and has paid back its government loans. But the small, peppy Fiat 500, which is Europe's No. 2-selling minicar after the Panda, hasn't kept the same pace. The 500 is well behind the 50,000-unit annual target once envisioned by Fiat-Chrysler CEO Sergio Marchionne. Since sales began in March, only 15,826 were sold through October. And last month 29 of Fiat's 130 U.S. stores didn't sell a single one. Internal Chrysler Group documents obtained by Automotive News Europe sister publication Automotive News show that, based on current selling rates, Fiat had roughly a half-year supply of Fiat 500 coupes and convertibles on Nov. 1. That's 13,730 units, almost as many as have been sold since March. In an effort to get things moving, Fiat began offering a $500 cash rebate this month. But the move comes too late to stave off production cutbacks. This month, because of slack demand, Chrysler laid off or reassigned 65 workers who build the engine for the Fiat 500 in Dundee, Michigan. Laura Soave, a former marketing executive with both Ford and Volkswagen, who became head of the Fiat brand in North America in March 2010, left Fiat on Monday. She was replaced by Timothy Kuniskis. The launch of the 500 was a key part of Marchionne's plan to reintroduce the Fiat brand to North America and give Chrysler Group a minicar. When Marchionne took over Chrysler Group in 2009, the smallest, most fuel-efficient vehicles the domestic automaker had were the compact "triplets" -- the Jeep Compass and Patriot and Dodge Caliber, none of which got more than 30 mpg on the highway, and all of which sold poorly. Chrysler hired Jennifer Lopez to pitch the 500 in a series of national TV commercials and asked dealers to build expensive separate showrooms to reintroduce Fiat in North America. Are sales slow because U.S. drivers don't want a car that small, or because Fiat has been too slow in rolling out its dealerships? Marchionne doesn't blame the car. Some dealers do. "The distribution network is probably half a year late," Marchionne told reporters last week on the sidelines of a Chrysler event in Toledo, Ohio. "We need to continue to work on distribution." Marchionne said Chrysler had "50 dealers or 60 dealers" for most of 2011. "I think Ferrari has more dealers than that," he said. Marchionne said the company underestimated the time it would take dealers to finish work on their stores. Instead of allowing existing Chrysler Group dealers to open Fiat sections in their showrooms, Fiat required the dealers to sign separate franchise agreements and eventually open separate facilities, which can cost as much as $3 million. Most Fiat dealers also have Chrysler dealerships. They could build temporary facilities in their existing stores but were required to erect separate, permanent stores by the end of 2012. Chrysler said last week that it had achieved its goal to open 130 Fiat stores this year. But dealers who have made major investments in new showrooms say the biggest sales obstacles are the 500's petite size and less-petite price. The base Fiat 500 sells for $16,000, including shipping. "We have customers that feel the car is really cute, and they wanted to see it, but they say they wouldn't buy a car that small," said David Rovny, general sales manager at Reedman-Toll Fiat in Langhorne, Pennsylvania. "People are expecting the car to be less expensive because of the size." Some dealers sold as few as 49 cars from March through October, while others sold as many as 370, according to Fiat's Final Daily Sales Report for Nov. 1. Olivier Francois, the Frenchman and former Chrysler brand chief who recently became global head of the Fiat brand, said a comparison of days supply is unfair with a new brand. "A brand in the launch phase is not the same as a brand that has been around for 85 years," Francois said on the sidelines of the Los Angeles auto show, where Fiat unveiled the North American version of the Fiat 500 Abarth, a high-performance version of the two-door minicar. The Abarth features a turbocharged 160-hp version of the 1.4-liter engine built in Dundee. Sales of the 500 peaked at 3,106 units in August and fell below 2,000 in October. Francois attributes the fluctuation to the "seasonality" of the brand. And sales of similar-sized cars aren't booming either. Through October, Mini sold 33,760 Coopers in the United States, down 12 percent from the same period of 2010. Sales of the Honda Fit are up 12 percent to 50,790 units. Of the 130 Fiat stores in operation, 101 reported sales in October. Those 130 stores averaged 15 sales per franchise, according to the internal report, while Mini's 97 dealers averaged 56 sales per franchise and Honda's 1,034 dealers each averaged 3 sales of the tiny Fit.